One of the best things about paint is it’s not permanent. So if you want to give your room a facelift by changing the wall colors, you can do so. But you can’t just apply a fresh coat of paint over the old one. The plaster walls need to be clean and stable so you have to remove the old paint first. Removing old paint can be a tough task since paint is designed to stick to the surface. So if you want to ease up the process, know the correct methods for paint removal and use specialized tools for the job. The most traditional way to remove paint from a surface is to simply use a paint scraper. Admittedly, this method can be somewhat tedious. It might take quite a long time to remove paint from a large area using this method, but it will work reliably. If you need to remove paint without spending a lot of money, then you are likely going to want to use a paint scraper. Paint scrapers will come in different sizes and shapes. The typical style that you will see is going to feature a flat blade and a short handle. You will be able to find paint scrapers that are somewhat wider and longer if you feel that those would suit your needs better. Scraping paint with these paint scrapers will work very well, but it will require a significant amount of effort on your part. This paint scraper here has a three-inch long blade and a very comfortable handle. It will feel natural enough to use while you are trying to scrape off paint from your walls. You will want to be careful when using these types of paint scrapers, though. You want to avoid damaging whatever surface you are removing paint from, so a certain amount of finesse is required. One of the reasons that these types of paint removal tools are so common is that they are inexpensive. You will be able to purchase several of these for a small amount of money. This will allow you to have several people using these manual paint scrapers, and you can potentially remove all of the paint in a reasonable amount of time. It’s a cost-effective paint removal tool that will be very useful to you. Wire brushes can be very useful for removing paint from small objects. Some people will use wire brushes on larger surface areas, as well. You can apply some paint thinner or paint remover to the surface and then use your wire brushes to remove the paint. This actually works very well and is a pretty cost-effective method of getting this job done. The reason that wire brushes are so convenient for smaller items is that you can use them effectively in small spots. For instance, if you are removing paint from some sort of small table, you will need to be able to reach spots that an electric paint removal tool could not. The wire brush will be able to get close to the table legs, and you can remove paint a lot easier. Paint removal can certainly be a taxing process, but you can make it easier by using the right tools for specific situations. There are going to be times when wire brushes will be the optimal way to remove paint from an object. It may not be the best tool for removing paint from the side of your house, but it is going to work excellently for small objects. This set of wire brushes here will definitely come in handy. There are six brushes in total, and they come in three different styles. You will get two nylon brushes, two brass brushes, and two stainless steel brushes. This is an affordable set of tools that will be useful to you when removing paint from certain things. An electric paint remover will help you to remove paint a lot faster than when using manual methods. 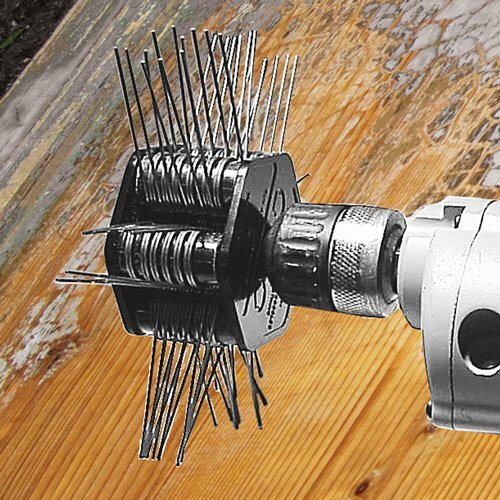 This power tool works by spinning a wire disc rapidly. In essence, it is the same thing as the wire brushes mentioned above. It is just far more powerful and a whole lot quicker to use. There are many advantages to using this electric paint removal, tool. You will be able to remove paint from larger surface areas in a timely fashion. A job that would take you several hours when using manual tools can be completed in a fraction of that time. This is very beneficial, and you will like being able to get things completed swiftly. It isn’t as simple to get this electric paint remover where you need it to go, though. It doesn’t have the same advantages as the wire brushes listed above. You still might be better off using manual tools for small items that you need to remove paint from. This electric paint remover is going to work excellently for walls, though, so you’ll enjoying having one of these tools available to use. This electric paint remover is very powerful. It has a 3.2 amp motor and can spin at 2,600 RPM. This is definitely going to allow you to make quick work of many paint removal jobs. Purchase one of these if you want to be able to remove paint fast. Applying a bit of paint and varnish stripping gel to the surface of an object makes stripping paint a lot simpler. This gel breaks down the paint at a chemical level and allows you to remove it without it being a hassle. If you use this gel properly, then you can make paint removal jobs a lot simpler. You just need to make sure that it is safe to use the gel on the surface of the object that you’re removing the paint from. Most people use this product in order to remove paint from their walls or other parts of their home. It can also be useful for removing paint from furniture. Some paint removers can be harmful to the surfaces that it is being used on, but this specific paint remover solution is not. It is capable of being used on wood and plaster surfaces without causing any damage whatsoever. It actually won’t damage any surface, but it is most commonly used on wood and plaster. You can use this paint remover to remove up to seven layers of paint at once. The color of this gel will change once the paint is ready to be removed. The paint is supposed to change to a pale green or off-white color to give you an indication that it is ready. This is important to have around when you want to make removing paint a quick and easy process. Combining this paint and varnish stripping gel with a few other paint removal tools will work excellently. It will be a pretty simple time, and you’ll love the results. One gallon of this paint and varnish stripping gel should be enough to take care of a lot of your house, so it will be a fairly affordable method to use, too. Heat guns are going to be important for removing paint from certain surfaces. When you need to remove the paint from something that will require a little more finesse, it is going to be useful to have a heat gun around. You will be able to make use of the high temperatures created by the heat gun to peel the paint off of the surface. In certain situations, this is going to be the best method that you can use. This heat gun here is pretty great at what it does. It is capable of producing heat up to 1,200 degrees Fahrenheit. It also features overload protection so that you don’t have to worry about the heat gun burning up. This will be an effective tool to have in your arsenal. You will want to be very careful when using a heat gun like this, though. The high temperatures produced by this heat gun could cause you great injury if you let it come into contact with your skin. For this reason, you may want to wear heat-resistant gloves while using this tool. Safety is very important, and you don’t want to have any unfortunate injuries. The heat gun feels very natural to use, so you should be able to use it without feeling too worried about having any accidents. It will work well for peeling off paint, and you can rely on it to get rid of stubborn paint that your other tools are having a hard time with. This tool isn’t too costly, either, so it’s definitely something for you to keep in mind when you have a paint removal task to take care of. You can also purchase a nylon wire brush that is meant to be used with your power drill. If you already own a nice power drill, then having this attachment is going to be very beneficial. You can use your nylon drill brush attachment to effectively remove paint from many surfaces. This will make the job pretty fast so that you can move on to the next step of your project. Attaching the nylon drill brush attachment to your power drill is really simple. It will just attach right to your drill bit, and you can use the drill to start removing paint. 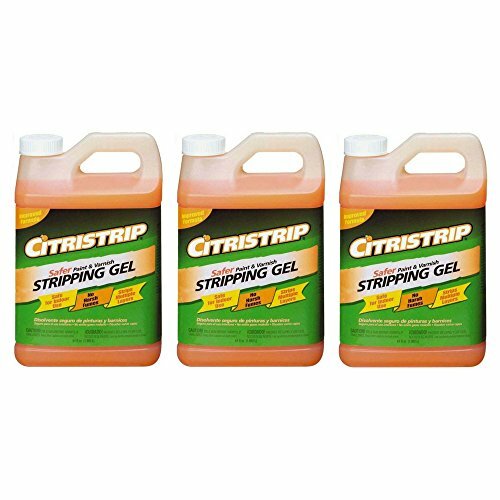 Many people use this in conjunction with the paint stripping gel mentioned above. It can remove loose paint fantastically, so it’s going to be a useful companion on your paint removal job. This drill attachment set actually comes with several different types of brushes as well. There is a two-inch short brush, a four-inch brush, and a more standard pine cone-shaped brush design. All of these work great, and you will want to use them in different situations. Having more options available to you is always a good thing, so the fact that there are multiple brush styles is to your benefit. These attachments will prove useful to you in other areas, as well. People often use them for cleaning up grills, stonework, and many other types of rough surfaces. The brushes are durable, and you will be able to get a lot of use out of them. This is a worthy purchase, especially if you already have a power drill. The power drill by itself is definitely not something that you would use to remove paint. You will need this tool in order to use drill attachments that are meant for removing paint. This attachment can be very useful, so it is worthwhile to own a good power drill. Being able to make use of some convenient paint removal methods is often worth the price of one of these drills. Power drills are something that can be used for many other purposes, too. You will be able to use a power drill for many different home improvement purposes. It will be handy whether you are putting together a bookshelf or if you are building a deck outside. Everyone should own a high-quality power drill that can make their jobs easier. This drill is one of the top drills on the market. It features an ergonomic grip that makes using it as comfortable as it can possibly be. It doesn’t weigh too much at all, and you will be able to fit it into tight spots in order to get jobs done. This is a compact power drill too, meaning that it is easy to take with you to different places. The roto stripper drill attachment is yet another reason that you will want to own a good power drill. This attachment is going to be quite useful when you want to remove loose paint from any surface. Using it in tandem with some paint remover gel will make your life a lot easier. You won’t have to spend too long removing the paint, and you’ll be able to get things completed faster. This attachment is actually so powerful that people also use it to remove rust. When rust has built up on one of your doors or any other metal item, you can use this drill attachment to effectively remove it. It has even been used to remove barnacles from ships, so you know that it has a lot of utility. This attachment will be a useful tool to have in your possession. This is designed to be used on many different surfaces, as well. It can be used effectively on wood, metal, brick, cement, fiberglass, and more. It will be a fast way to remove paint from many types of surfaces. As long as you have a quality power drill, you will be able to make use of this convenient attachment. People often use pressure washers in order to remove paint or varnish from their decks. If you have used a pressure washer in the past, then you should know that these tools can spray water at a high velocity. This water pressure is capable of dislodging paint from a surface. If you need to remove old paint from a deck or from your barn, then a pressure washer will make the process a lot simpler. There are many different types of pressure washers on the market. The most typical pressure washers that you will see are electric-powered pressure washers. These should work just fine for your purposes, but there are more powerful models out there if you wish to keep looking. The ones that are powered by gasoline are generally more powerful, but they are noisier and far less clean. Regardless of what type of pressure washer you choose to purchase, you should be able to use it for your intended purposes. The pressure washer can be sprayed on your deck or barn to remove paint. Sometimes people will still use paint remover gel or paste in order to loosen the paint. This may or may not be necessary depending on several other factors. It is also worth noting that you probably won’t want to use the pressure washer inside of your home. It is possible to do so but it is too messy to make it practical. This is a good tool to use for outdoor paint removal purposes. You will be able to buy one at a fair price, and it will definitely be useful. A good sander is going to be helpful when you want to prepare a surface to be painted. You want to remove as much of the paint as possible in order to have good results when you paint the surface again. Using a power sander such as this disc sander is going to work nicely. You can remove the paint quickly and safely by using this method. This sander is capable of making short work of most paint removal jobs. It is easy to hold in the palm of your hands and you can glide it across the surface smoothly. It won’t be cumbersome to hold so you will be able to complete your job without feeling too fatigued. This is a lightweight tool that still packs a lot of power. Sanders like this can make a bit of a mess, so you will need to be prepared to do some cleaning up. They will produce a lot of dust, so laying down plastic on your floors if you are removing paint indoors is highly recommended. There are many types of sanders to choose from, but disc palm sanders like this one are probably the most convenient. This will partially come down to your personal preference and what type of job you are trying to do. A manual sanding block will be able to do the same thing as a disc sander would. It will simply take you longer to do it. The good thing about these manual sanding blocks is that they are very inexpensive. You will be able to purchase several of these and can use them to remove paint effectively. If you are removing paint from something smaller, it makes sense to use one of these. You will be able to remove the paint without taking too much time, and you can be very precise with this type of tool. The sanding block can fit in tight spaces and you just generally won’t have a hard time. It’s a good tool for large surfaces, as well, so long as you are prepared to spend a fair amount of time working. You should always wear safety goggles when you are removing paint from surfaces. It would not be good if you got paint debris or dust into your eyes. This could cause you serious injury, and it is something that can be avoided by purchasing an affordable pair of safety goggles. If you plan on using any power tools to remove paint, then these will be crucial. It can be smart to wear safety goggles even when you are using manual tools. The act of removing paint is going to kick up dust, and this can negatively impact your eyes. Keep them safe and purchase the safety goggles that you need. They’re very affordable and easy to wear, so there is really no reason to avoid purchasing a pair. It is also smart to go ahead and purchase a protective mask to wear during your job. The dust that is being created by removing the paint is going to be bad for you to breathe in. A simple protective mask can keep you from getting sick and having a coughing fit. If you want to be able to get this job completed in a timely fashion, then you need to be able to stay on task. You don’t need to buy an extremely fancy protective mask in order to protect yourself. A standard mask is going to be able to keep you from breathing in bad particles. You’ll feel a lot safer with the mask on, and you won’t have to worry about the mess that you are making. It’s going to be easy to get these, so just make sure that you have what you need before you start removing your paint. This pack of masks comes with ten masks that you can use. This is going to be very useful if you have multiple people helping you to remove paint. You’ll be able to hand out masks to everyone, and you can all stay safe from harm. It’s a simple solution to a potentially annoying problem.